Educational Qualification : For Consultant : Bachelors Degree in Journalism / Mass Communication / PR with 55% mark in aggregate from a recognised university OR Post Graduate Degree in Management/Social Sciences, Humanities and Education with 55% mark in aggregate from a recognised university. For Sr. Consultant : B.E. / B.Tech. in Computer Science & Engineering from a recognised University with at least 55% marks in aggregate OR Post Graduate Degree in Computer Science & Engineering/Information Technology/Information & Communication Technology/MCA/Information Systems discipline with 55% mark in aggregate from a recognised University. For Chief Consultant : Post Graduate Degree in Accounting or Business Administration (Finance) with at least 55% marks in aggregate or ICWA/CA from a recognised university. 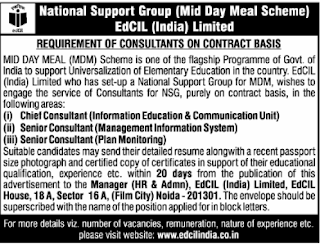 EdCIL Recruitment Selection Process : Selection will be based on group discussion and / or interview. How to Apply EdCIL Job Vacancy : Interested candidates may apply Online through the website www.edcilindia.co.in on or before 17.10.2017 till 06.00 PM thereafter website link will be disabled. Last Date for Submission Of Online Application : 17.10.2017.